Last weekend was Armistice Day and Remembrance Sunday. It was also the weekend my sister Jo came to visit, along with her OH, Phil. M was very excited as she likes seeing her relatives, which sadly doesn't happen that often due to the distances involved. 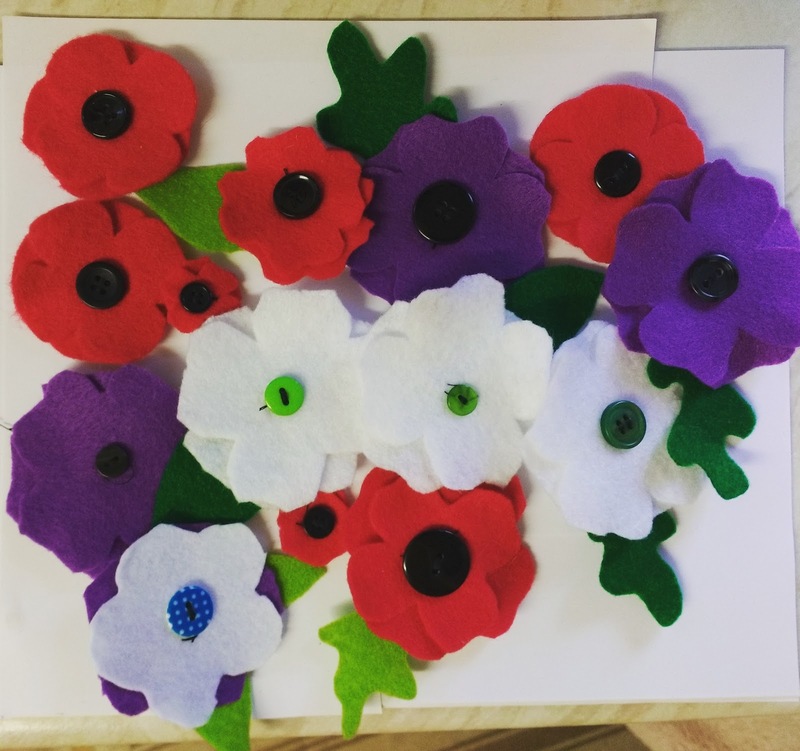 We spent some time on Thursday and Friday making poppies from felt with a sewn on button. We made these last year, but they were mainly my effort with M only doing a little of the stitching. This year, once I'd shown her how to sew on a button, M did most of the work herself. She even cut the shapes out of felt. A lot of sewing practice! We added a purple poppy to the collection this year after learning they were to represent all the animals who died in wars, particularly the horses who were very much on the front line in WW1. M spotted a very similar flower hair tie in a children's sewing book I'd bought her for her birthday. After reading the instructions, M had a go, resulting in the white and purple flower with the blue spotted button. 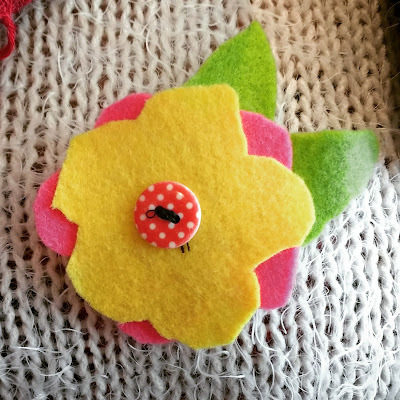 I helped by sewing it onto a hair tie as that bit was too fiddly for M. Still needing to make more flowers, M decided to make another one for her Auntie Jo, but this time we glued it to a pin along with all the poppies. A flower for Auntie Jo. These were all lots of fun to make and served well for teaching M how to sew a button on. We showed Auntie Jo around Brandon Marsh on Saturday. While on Sunday we drove over to The Black Country Living Museum, which is a fantastic place to visit and the location of most of the external filming for a television program called Peaky Blinders, which both Jo and Phil love. We're oblivious to the TV show, but love history and exploring buildings, so were happy as well. 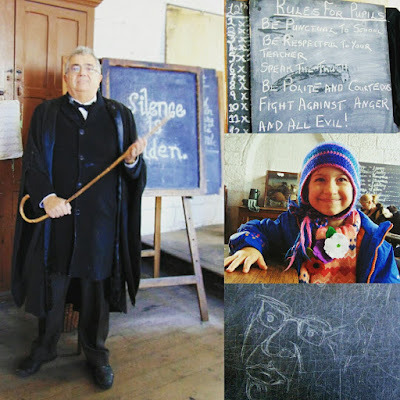 M experiences a Victorian School. M experienced her first lesson in a school, taught very tongue in cheek by a Victorian school master. Baffled, M did her best to recite her 12 times tables, learned about Victorian discipline and the rich fossil record of Dudley. She also learned about the famous one eyed dinosaur of Dudley, something M quizzed Dave about later. Otherwise we wondered around looking at things, talking to the historical interpreters and trying not to get too cold. It was a bitter wind out there! We hid in the old cafe building by the canal to enjoy some chips, sandwiches and a hot drink. M played with her auntie and Jo took a lot of photographs. I took a couple of photographs too, including the source reference for this drawing of one of the museum horses being plagued by magpies intent on stealing its mane. 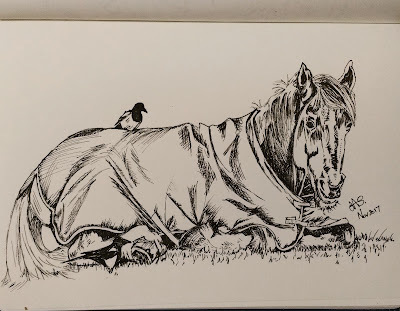 As we watched, the magpies would go up to the horse's neck and pluck at a hair, resulting in the horse waving its head at the offending bird, which duly flew off only to return less than a minute later. Drawing of one of the horses at BCLM. A good day, but gosh we were cold and it took hours before we felt warm again that evening.